Some time ago my husband wished for a grilled dish. And yes, the idea was great! As a family, we like grilled dishes, and with simple requirements, you can make pretty good and tasty plate. One of the benefits of making a grilled eating is that you can make it almost throughout a whole year. Some of our friends have their grills located in the yard of the houses from early spring until the late autumn. During winter days, well, we try to be in warm places, so grilling is on standby until the sun beats the cold. So, John’s proposition is excellent, and I, as always, have some ideas related to cooking – but, we came across a problem. Our charcoal grill is literally eaten by the rust. I don't want to start talking about who, why and when has forgotten to clean it up and store it in the goods shed. The problem is in front of us, and we must do something about it. I've tried to let my husband do the research job, but since his stance was ok, I'll go and buy something good, I knew that he wouldn't even ask what he should look for. After managing to prolong his decision, I've done some research on the topic of the best charcoal grill you can get. Buckle up; this is where research has taken me to. What To Know Before Buying A Charcoal Grill? Firstly, we have to understand – buying a charcoal grill represents an investment. Therefore, it simply can't be done straight-forward. At the start, you must consider which dishes you want to cook, and what will be the amount of food you need to prepare for eating. There is a wide variety of charcoal grills at the market, and they all come in different sizes, measured in square inches of cooking space. So, are you making grilled ribs for two, burgers for friends coming to a party or maybe you intend to smoke a chicken – that will determine what size of charcoal grill you need. I will share with you a little chart which can be very useful when it comes to ratio. Next thing that you have to have in mind is where you will place your grill. For example, if the grill is to be kept outside, it is best that it is made of stainless steel or heavy gauge. In other words, it needs to be resistant to rust. Otherwise, you will be getting a new one very soon. Firm construction of the grill is really needed because you will probably move it from one place to another. So, solid legs will make sure that grill is steady when moved around the yard. All the details said so far about the charcoal grill are related to the external construction. Now, we have to look at the cooking space and what there can be found. Grill surface, or – grill grates, is the next item that we need to give attention. Beside the external construction of the grill that must be durable, grill grates are also important. Easy to clean, endurable to high temperatures, and a non-stick surface of the grates represents something that you should be aware of. Although you will have to put some seasoning on cast iron grates, their lifetime is the longest, the food doesn't stick, and will they provide more heat. When looking for a new charcoal grill, next stop is – airflow control. This means that grill must be able to "capture" and keep the temperature, and this is managed through airflow vents. Every good grill has these vents on the lid and the bottom. This means that dual vents will give you much easier control of the airflow. And one more thing, it is also considered by the many that the "sign" of a good grill is the possibility to shut the vents down together with fire and save the remaining charcoal for the next time. So, the punch line is this – why spend way much more charcoal when you can be economical? Probably, when you set off to buy a new grill, you will see that some of them have bonus features or extras. Related to grill, these extras are some useful little gadgets or utensils that you will find useful. You may take a list below into consideration. Thermometer – some grills have it already built-in. This little gadget is allowing you to know what temperature you are cooking the dish inside, especially if you are grill-roasting. Insulated handle – yes, surely you don't want to overcook, burn, dry out the dish, but since we are taking care of the meat inside, it is desirable to take care of the meat outside – our hands. The insulated handle gives you a safe way of opening and closing of the grill lid. Handy, and efficient – right? Side table and utensil holders – in case that you suddenly need to run from point A to point B, because something unexpected occurred and you have to put down the grill brush, or you forgot to bring something close to grill – these extras will help you everything go smoothly. Locking lid – this "extra" will have the practical use, especially if you have to move the grill during the cooking. No spilling of charcoal, no meat falling out. Simple. Ash catcher – big and easy to remove – must have. 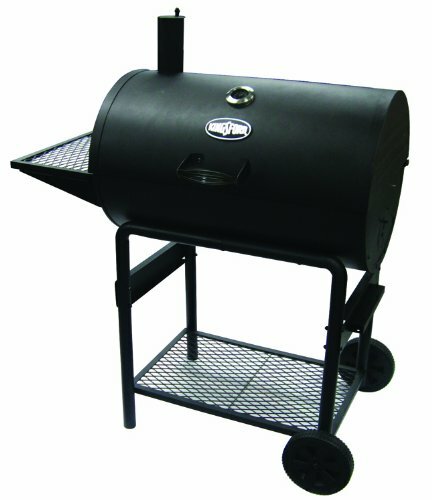 Smoker box – last but not the least, some charcoal grills have it already built-in. This "extra" will give yours cooking a smoky flavor – my favorite. Finally, be reasonable in price. You don't have to spend enormous amounts of money on the charcoal grill, and this is recommended by the many buyers or reviewers. No matter if you are budget-limited or budget-unlimited, ALWAYS have in mind the first thing I've mentioned – know the need of the grill – how many hungry people equals the size of the grill. Here’re the five best charcoal grill reviews that I’ve made while looking for the perfect one. As you might notice - yes, this grill looks like ﻿an eg﻿﻿g. On the other side of the world, Kamado cooking represents the traditional cook stove, in which you can put wood or charcoal. We can say that this type of cook stove is developed and perfected through the period of 3000 years. This grill has, in total, 447 square inches of space which is separated to 314 square inches of cooking space, and 133 square inches of warming rack. This means that you easily can prepare dishes for 3-4 hungry mouths. With this grill, you can be sure that it will last for a long time. And why is that? 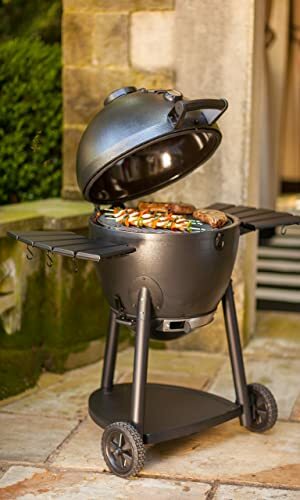 Well, triple-walled insulated steel and 22-gauge steel which is built-in the exterior body is taking care that this charcoal grill will serve you properly. Also, you will find that interior is porcelain coated steel. Assembly guide tells you that with Akorn Kamado you can get 700 degrees, and some buyers stated that they never passed 650 degrees. You actually don't need 700 degrees, and take caution – you need to get used to this style of cooking. Also, there are only a few reports back to Char-Griller related to air leaking. So, airflow control is good, and you can easily manipulate it. As you might have heard, Weber's Original Charcoal Grill is the definition of kettle grills. 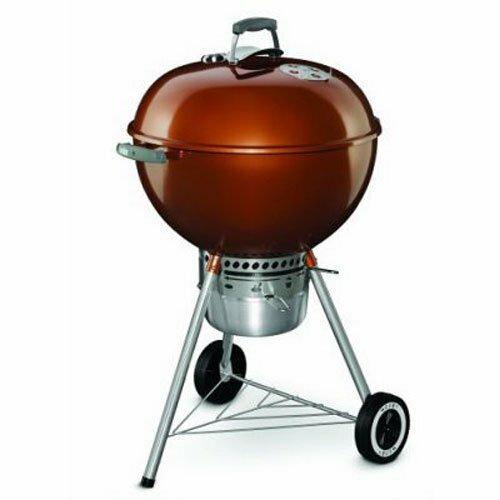 The design of the grill remained unchanged for decades, and it is used by many generations. In other words, this grill is probably the best outdoor cooking tool ever designed and built. Webber Original kettle grill has 363 square inches of cooking space. This means that this grill can provide you with an ability to grill even the turkey, and excellent airflow control makes it a good "smoker". As a matter of fact, this grill is equipped with air venting control of which many grills can only dream about. Literally, this grill will drag you to experiment with vents and airflow, and while being economical with the usage of the charcoal, you can easily preserve the charcoal for the next time. Simply, just shut down the vents, and deficiency of air will do the rest. Further, Webber's Original Kettle Grill comes with 10 years of warranty. Sturdy construction and easy to clean will make this grill last for many, many years. Ash catcher, together with air vents is made out of aluminum and it won't rust. On the other side, steel-plated cooking grates will rust, but only if you don't give them a proper care. When you realize and understand that you have become an experienced cook, and you want to extend yours cooking view, well, Kingsford Barrel Charcoal Grill is something to be involved with. In general, barrel grills are larger and maybe more versatile than kettle grills. With them, you can try slow cooking and smoking, and thankfully to larger space, you can easily increase the amount of food that needs to be prepared. Related to what has been mentioned above, Kingsford Barrel Charcoal Grill really stands out. Cooking space of this grill is very large – 793 square inches! In terms of amount, prepared food will reach up to 30+ burgers, grilled at the same time. Or, you can easily prepare two or three different dishes at the same time, the choice is yours. What makes this grill long-lasting is his sturdy construction. Kingsford Barrel Grill is built to endure the tests of time, and that is because its body is made out of solid steel, and cooking grates out of cast iron. One more thing, thermometer gauge on this grill is remarkable and very, very precise. In other words, you don't need to be the master chef and know every temperature chart in the world – this grill will easily help you. Char-Broil's TRU-Infrared Kettleman Charcoal Grill represents a direct answer to Weber's Original Kettle Charcoal grill. When you write down on a piece of paper what are similarities between these two grills, you will find many, but – Char-Broil is promising you a little more. "TRU-infrared" might sound strange and unusual to you, but actually – that is nothing new. While burning, charcoal projects over 25% of heat as infrared, and that fact is what makes this grill a bit extraordinary. Yes, it will provide you constant temperature, but, if you're not rational, over time you will spend an amount of charcoal like on any other grill. Also, the distance between fire and food is shorter, which means that you may use a shorter period of time and a smaller amount of charcoal to prepare the dish. On the other side, this grill has only one air vent located on the top. Bottom vents can't be shut down, and the result is that you won't be able to shut down the fire inside until all charcoal is spent. When you assemble this grill, it would seem to you that it's not really a tight-packed product, but don't be discouraged – Char-Broil's TRU-Infrared Kettleman Charcoal Grill does what it promises. Being very efficient on the fuel usage, it will give you high-temperature cooking without any single flare-up. Although this grill comes with 10 years warranty, lower quality of it can distract you to look for a bit better product in the same category. "Dual usage" is something that is not stated in the title, and this is what makes this grill interesting. 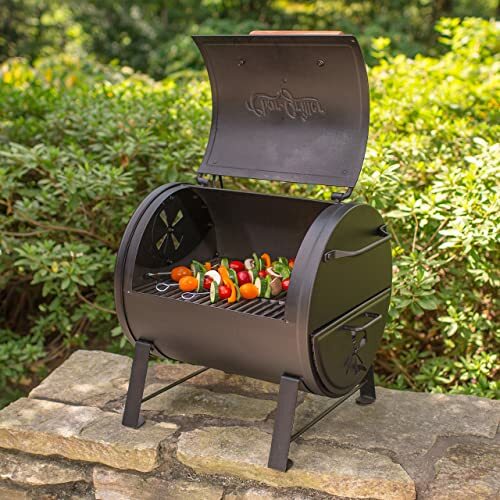 If you are by any chance proud owner of the Char-Griller Pro Deluxe, Outlaw, Wrangler, or Duo – 2-2424 can be attached to any of them and used either as fire box or smoker. But, there's the catch, when you use 2-2424 as a fire box or smoker, you can't use it as a grill – it remains fire box/smoker until disassembly. On the other side, you don't have to use "dual usage" function. Simply, you can use it as a grill. In contrast to the previous four grills, Char-Griller Top Charcoal Grill has a little bit less cooking space – 250 square inches. This is not actually a flaw because it is smaller in size, portable and yet sturdily constructed to endure any type of moving without of fear that it may be damaged. The body is made out of heavy steel, cooking grates are made out of cast iron, and everything is porcelain-enameled so the cleaning can be done quickly. 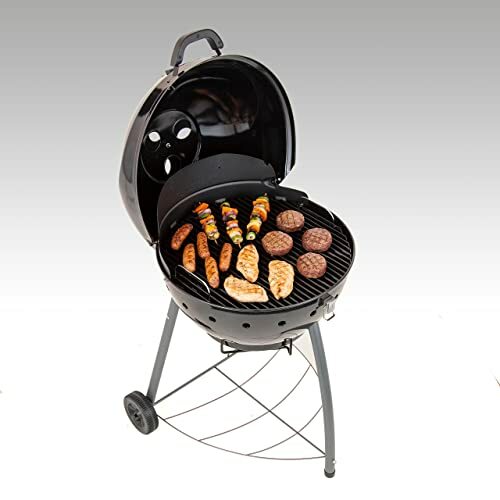 Char-Griller Top Charcoal Grill provides very good heat control – although being a smaller type of grill, and many of users are pointing out the effectiveness of the damper system, with the conclusion that it would be great if this grill had it more. At this point, we have looked and reviewed five very best charcoal grills on the market. For John and me it’s clear - we will go with the Webber Original Kettle ﻿﻿Premium﻿﻿ Charcoal Grill, because we decided it is the best one for us and our needs. It is affordable, versatile, long-lasting, and in other words - pretty much the best grill on the market.